The first new-build aircraft to be manufactured at Daedalus Lee-On-Solent Airfield by Britten-Norman flew for the first time earlier this month (July 2012). Seen here in yellow primer ahead of the application of the customer paint-scheme, production of this BN2T-4S Defender aircraft for the Police Service of Northern Ireland began in the Dunning Hangar in 2010. 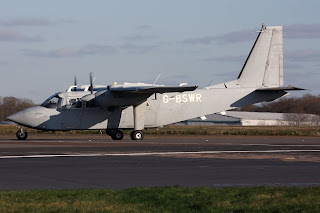 Several test flights have been made as the company progresses towards the issue of a Certificate of Airworthiness by the Civil Aviation Authority. Visit http://www.britten-norman.com/ for further information on products and services offered by Britten Norman.